For the past three decades, as the climate has warmed, the massive plates of sea ice in the Arctic Ocean have shrunk: In 2007, scientists observed nearly 50 percent less summer ice than had been seen in 1980. Dramatic changes in ice cover have, in turn, altered the Arctic ecosystem — particularly in summer months, when ice recedes and sunlight penetrates surface waters, spurring life to grow. Satellite images have captured large blooms of phytoplankton in Arctic regions that were once relatively unproductive. When these organisms die, a small portion of their carbon sinks to the deep ocean, creating a sink, or reservoir, of carbon. A paper by Dutkiewicz and co-authors Mick Follows and Christopher Hill of MIT, Manfredi Manizza of the Scripps Institute of Oceanography, and Dimitris Menemenlis of NASA’s Jet Propulsion Laboratory is published in the journal Global Biogeochemical Cycles. The cycling of carbon in the oceans is relatively straightforward: As organisms like phytoplankton grow in surface waters, they absorb sunlight and carbon dioxide from the atmosphere. Through photosynthesis, carbon dioxide builds cell walls and other structures; when organisms die, some portion of the plankton sink as organic carbon to the deep ocean. Over time, bacteria eat away at the detritus, converting it back into carbon dioxide that, when stirred up by ocean currents, can escape into the atmosphere. The MIT group developed a model to trace the flow of carbon in the Arctic, looking at conditions in which carbon was either stored or released from the ocean. To do this, the researchers combined three models: a physical model that integrates temperature and salinity data, along with the direction of currents in a region; a sea ice model that estimates ice growth and shrinkage from year to year; and a biogeochemistry model, which simulates the flow of nutrients and carbon, given the parameters of the other two models. 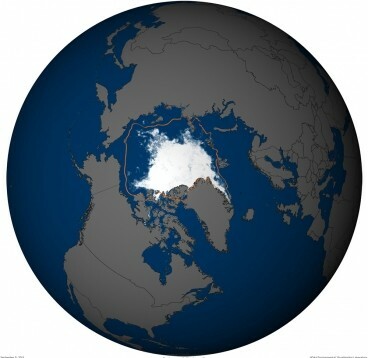 The researchers modeled the changing Arctic between 1996 and 2007 and found that the ocean stored, on average, about 58 megatons of carbon each year — a figure that increased by an average of 1 megaton annually over this time period. These numbers, Dutkiewicz says, are not surprising, as the Arctic has long been known to be a carbon sink. The group’s results confirm a widely held theory: With less sea ice, more organisms grow, eventually creating a bigger carbon sink. However, one finding from the group muddies this seemingly linear relationship. Manizza found a discrepancy between 2005 and 2007, the most severe periods of sea ice shrinkage. While the Arctic lost more ice cover in 2007 than in 2005, less carbon was taken up by the ocean in 2007 — an unexpected finding, in light of the theory that less sea ice leads to more carbon stored. Manizza traced the discrepancy to the Greenland and Barents seas, regions of the Arctic Ocean that take in warmer waters from the Atlantic. (In warmer environments, carbon is less soluble in seawater.) Manizza observed this scenario in the Barents Sea in 2007, when warmer temperatures caused more carbon dioxide to be released than stored. The results point to a subtle balance: An ocean’s carbon flow depends on both water temperature and biological activity. In warmer waters, carbon is more likely to be expelled into the atmosphere; in waters with more biological growth — for example, due to less sea ice — carbon is more likely to be stored in ocean organisms. In short, while the Arctic Ocean as a whole seems to be storing more carbon than in previous years, the increase in the carbon sink may not be as large as scientists had previously thought. This research was supported by the National Science Foundation and the National Oceanic and Atmospheric Administration. I mega ton of Sea ice? Can there be data chart from 1982 to 1992?